NEW ORLEANS, Jan. 27, 2017 /3BL Media/ – Carl Swope, president of Swope Toyota in Elizabethtown, Kentucky, was named the 2017 TIME Dealer of the Year today. Swope was selected from a group of 49 nominees from across the country, and recognized at the 100th annual National Automobile Dealers Association (NADA) Convention & Exposition in New Orleans on Friday. 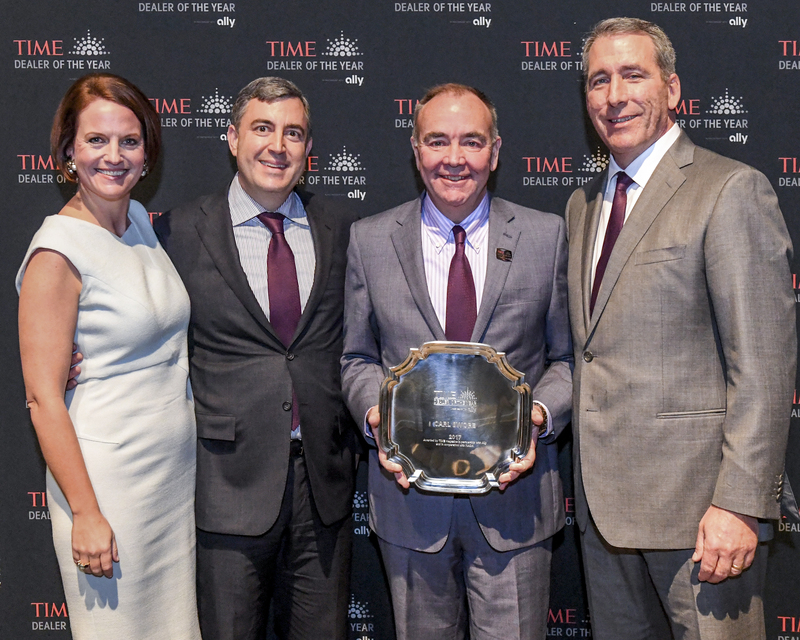 The announcement of this year's national TIME Dealer of the Year and finalists was made by Meredith Long, Senior Vice President and General Manager, News and Luxury at Time Inc. and Tim Russi, President of auto finance for Ally, at the formal opening of the convention. In its sixth year as exclusive sponsor, Ally donated $1,000 to the charity of choice for each of the dealer nominees and will provide $10,000 to the nonprofit selected by the 2017 TIME Dealer of the Year winner. In addition, the three finalists, as well as the state Automotive Trade Association Executive (ATAE) who nominated the 2017 winner, will each receive a $5,000 grant for the nonprofit organizations of their choice. All nominees are featured on AllyDealerHeroes.com, which highlights the philanthropic contributions and achievements of auto dealers across the United States. The TIME Dealer of the Year award is one of the automobile industry's most prestigious and highly coveted honors. Recipients are among the nation's most successful auto dealers who also demonstrate a long-standing commitment to community service. Swope, 59, was chosen to represent the Kentucky Automobile Dealers Association in the national competition – one of only 49 auto dealers from 16,000 nationwide – nominated for the 48th annual award. The award is sponsored by TIME in association with Ally, and in cooperation with NADA. A panel of faculty members from the Tauber Institute for Global Operations at the University of Michigan selects one finalist from each of the four NADA regions and one national Dealer of the Year. Swope graduated from Elizabethtown High School in Elizabethtown, Kentucky and earned a B.S. in business administration from Indiana University Bloomington in 1978. A second-generation automobile dealer, Swope followed in the footsteps of his father and uncle who opened their first dealerships in 1952. He has worked in all phases of the retail automobile business at his family stores, and he even sold cars to friends and faculty while studying at Indiana University. Today, he oversees six dealerships representing nine brands in Elizabethtown and Radcliff, Kentucky. Since the early days of his career, Swope has worked tirelessly to support a wide range of civic activities, from helping families at nearby Fort Knox to raising money to restore the historic downtown district. In the early 1990s, Swope helped establish the local affiliate for Habitat for Humanity and the statewide Kentucky Habitat. In 1997, he helped organize a Jimmy Carter Work Project called Hammering in the Hills where President Carter, Mrs. Carter and volunteers built more than 50 homes in Pike County over a one-week period. Swope remains active in Habitat for Humanity projects, working with his colleagues to help families in his community. Swope’s associates have followed his lead, and also make important contributions to the community. They renovate offices and classrooms for local nonprofit organizations and schools through a United Way-sponsored effort called Project United. They also fill backpacks with nutritious food for children in need and prepare care packages for deployed soldiers. Swope currently serves on the Hardin County Chamber of Commerce President’s Circle; the Knox Regional Development Alliance; Lincoln Heritage Council for the Boy Scouts of America; Elizabethtown Tourism Commission; Elizabethtown Airport Board; and Hardin Memorial Health Foundation. Swope was nominated for the TIME Dealer of the Year award by Gay F. Williams, president of the Kentucky Automobile Dealers Association. Swope and his wife, Anne, have three children and three grandchildren. Ally Financial Inc. (NYSE: ALLY) is a leading digital financial services company and a top 25 U.S. financial holding company offering financial products for consumers, businesses, automotive dealers and corporate clients. Ally's legacy dates back to 1919, and the company was redesigned in 2009 with a distinctive brand, innovative approach and relentless focus on its customers. Ally has an award-winning online bank (Ally Bank Member FDIC), one of the largest full service auto finance operations in the country, a complementary auto-focused insurance business, a growing digital wealth management and online brokerage platform, and a trusted corporate finance business offering capital for equity sponsors and middle-market companies.